Summary: TTL turns 50, more or less, in 2014. Alert reader Caron Williams notified me that 2014 marks the 50th anniversary of TTL (transistor-transistor logic). Wikipedia (http://en.wikipedia.org/wiki/Transistor%E2%80%93transistor_logic) says that, though TTL was invented in 1961, TI released the 54 family in 1964, and that the 74 series in plastic came out two years later. Since TTL is practically synonymous with the 54 and 74 series, why not offer 50th birthday congratulations? Remember that the IC was invented just a few years before TTL came out. Other kinds of logic were commonly used, like DTL (diode-transistor logic) and RTL (resistor-transistor logic). In fact, the Apollo guidance computer was made entirely from RTL components, using several thousand identical ICs, each containing a pair of three input NOR gates. The schematic is clear: RTL logic was barely digital. It wasn't uncommon for RTL users to bias the transistors nearly linearly and use them as amplifiers. But RTL persisted into the 70s, and in the late 60s we were using gobs and gobs of Fairchild parts for Apollo ground support equipment. The perfect gate can only assume two states, and RTL's linearity was exactly the opposite of what the digital world strived for. TTL was designed to approach that ideal. 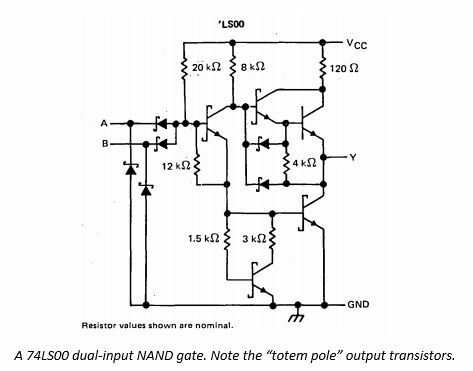 Like an op amp we also want zero output impedance, and many TTL gates used a "totem pole" configuration of transistors to offer plenty of drive and sink capability. As mentioned, the anonymous experts at Wikipedia believe the 54 series predated the much more common 74 family by a couple of years. The main difference between the two was the temperature range; 54-series devices generally operated from -55 to 125C, while the 74 parts, housed in inexpensive plastic packages, were rated from 0 to 70C. Though the 54 family was often called the "military" version, a lot of commercial applications demanded their extended temperature range. TTL devices were either SSI (small scale integration), which meant one package contained a couple of flip flops or a few gates, or MSI (medium scale integration), which were more complex parts like multiplexors. The 74181 was an example: it contained an ALU that could add, subtract and do logic operations on two four-bit inputs. The DIP package had 24 pins, which was enormous in those days. By the late 60s most computers had oceans of TTL components. The following picture is the CPU board from a Nova 1200 16-bit minicomputer. 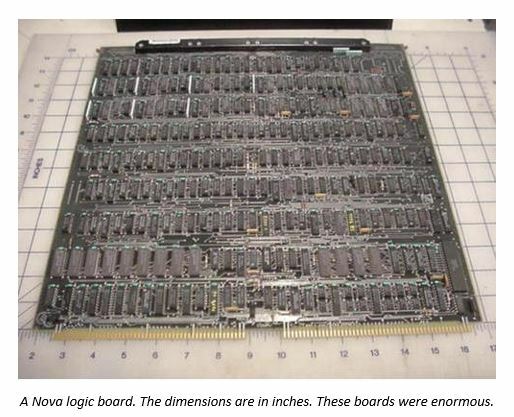 There were no MOS memories at the time; another board held core memory. All of these DIP packages are 74-series TTL devices. Components were so expensive that the earliest Novas used one 74181 four-bit ALU; it pushed a word through one nibble at a time. As time went on many versions of the 74/54 devices appeared. 74LS parts were lower power and faster than the original components. 74HCT used less power. Today there are a dizzying number of families, and it can be a chore to pick a component from the cornucopia. I've been using 74AUC08 gates recently, which are blazing-fast. Most of the early parts are unavailable today. Digi-Key doesn't list any 74-series parts, though they still supply 74LS and some others that are well into their dotage. 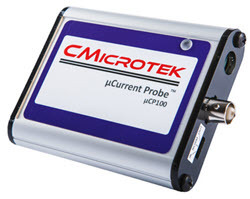 Only 13 DIP devices appear from the thousands of TTL part numbers they sell. 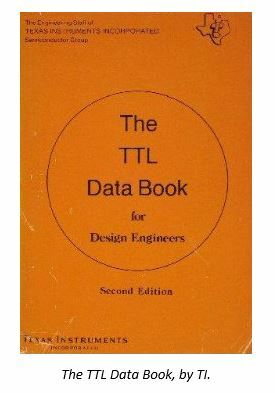 Though lots of vendors sold, and still sell, 74 logic, old timers remember the industry bible: TI's TTL Data Book. For many years it was beautifully hard-bound, though later editions were paperbacks. Every year it got thicker till they started producing multi-volume sets. Once a year the distributors would have an open-databook day; we'd fill the trunks of our cars with books about all sorts of components. Pre-PDF, pre-Internet, these tomes were how we sourced parts. The paperless office never appeared, but the datasheetless office sure did. PDFs are great as they are mostly up-to-date and take no room. And modern datasheets can be enormous, running to thousands of pages for a single component. But it sure was nice to have many books open on the bench or the drawing board. Oh, a "drawing board" was a six-foot long tilting table where engineers drew their schematics using "pencils," "drawing machines," and a variety of other tools. But that's another bit of ancient history.